HRH Princess Latifa Bint Saad Bin Abdulaziz Al Saud opens Salon des Grandes Complications watchmaking exhibition in Jeddah. HRH Princess Latifa Bint Saad Bin Abdulaziz Al Saud inaugurated Salon des Grandes Complications in Jeddah during an official ceremony on 8th April 2019. This year sees the hugely successful fine watchmaking exhibition return to Jeddah for the third time, taking place once again alongside Saudi Arabia’s esteemed Jewellery Salon. The event, which is open to the public over four days until 11th April 2019 evening, sees striking timepieces from some of the most celebrated watchmakers in the world showcased at the Hilton Hotel. Present with their newest collections, innovative custom-made timepieces and much appreciated classics for watch lovers to explore are Blancpain, Breguet, Fabergé, Girard-Perregaux, Greubel Forsey, Harry Winston and Montblanc, with the support of retailers Alfardan Jewellery and Al Hussaini Trading Company. Salon des Grandes Complications has captured the attention of watchmaking enthusiasts from across the Kingdom for several years now, acting as an authentic platform to facilitate dialogue between collectors and brands. On wrapping up in Jeddah, the event will move to Riyadh’s Al Faisaliah Hotel from 15th-18th April. Both events are held in partnership with Bentley Motors and with the support of the Embassy of Switzerland in Saudi Arabia. LVMH group recorded growth of 9% in the Q1 2019 for Watches & Jewelry Division. LVMH Group reports a positive 2019 first quarter for the Watches & Jewelry Division, which comprises TAG Heuer, Bulgari, Hublot and Zenith among others. With revenue of just over EUR 1 Billion during the period (EUR 1,046 million to be precise), the Watches & Jewelry Division records a 9% reported growth, while the organic growth is up by 4% compared to the same period in 2018. The innovative products presented by LVMH's watch brands at the Baselworld Watch & Jewelry Fair were very well received, including Hublot’s Classic Fusion Ferrari GT watch, Bvlgari’s Serpenti Seduttori and Octo Finissimo Chronograph GMT Automatic watches, TAG Heuer’s connected watch model for golfers, and Zenith’s new Defy Inventor and Defy El Primero 21 Carbon models. If the trend continues, the LVMH Group could be on track for another record year. Longines honors the winners of the Longines Dubai Sheema Classic. As the Official Partner and Timekeeper of the Dubai World Cup, Longines was proud to time the nine races of the Dubai World Cup, held on 30 March, at the Meydan Racecourse. The Swiss watch brand also lent its name to the Longines Dubai Sheema Classic, one of the biggest turf races in the world, claimed by Old Persian led by William Buick. 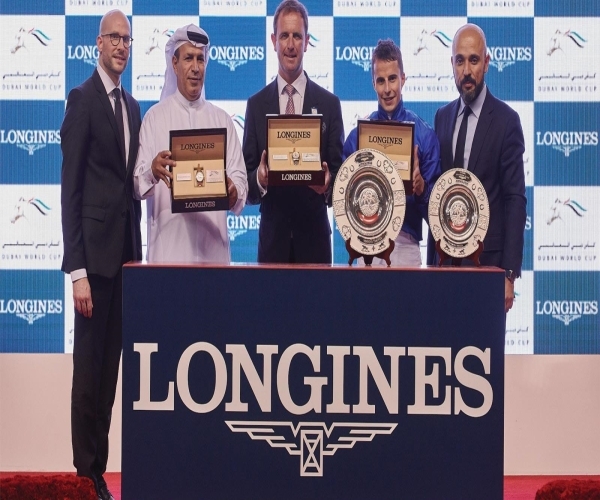 Godolphin’s winning owner representative, trainer and jockey received elegant timepieces from the hands of Matthieu Baumgartner, Vice President Marketing of Longines and Patrick Aoun, Brand Manager of Longines Middle East. Rebellion timepieces at the start of a new partnership with Goodwill. 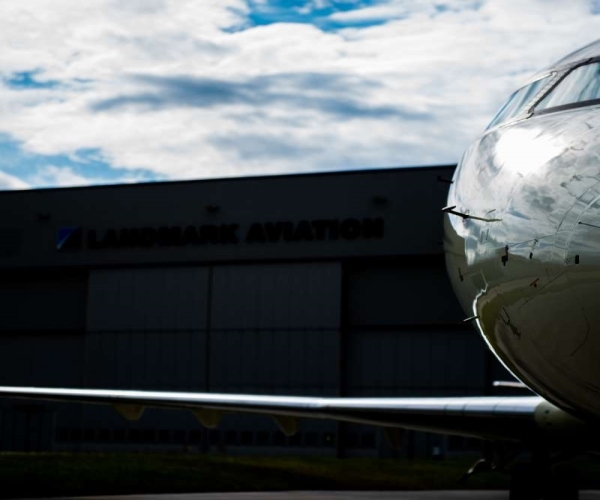 Rebellion Timepieces announces the launch of a new high-flying partnership with Goodwill, the leader in business aviation. Through this timeless partnership, the two companies will develop hand-in-hand unique experiences for their private clients. Namely the possibility of joining the Rebellion Racing team and drivers on circuit. Ulysse Nardin partnership with Ben Thouard. 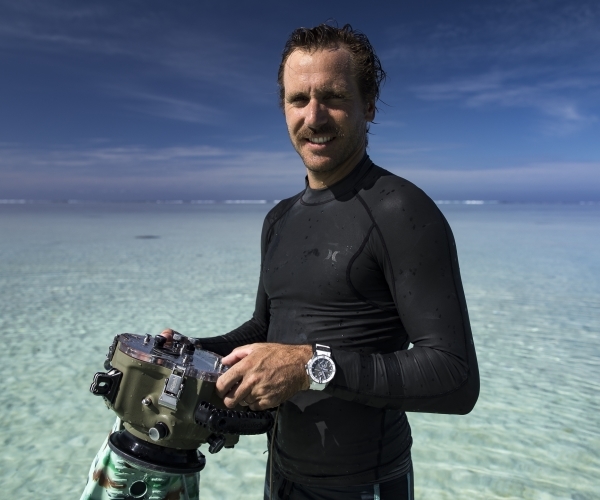 Ulysse Nardin announce its partnership with a talented new photographer, a hunter of moving water, light, transparency and poetry: Ben Thouard. This spring, Ben Thouard joins Ulysse Nardin's Armada of explorers alongside freediver and photographer Fred Buyle. In love with the ocean and armed with his photo equipment and his DIVER Great White 44 mm, Thouard chases waves, their strength and their clarity in a quest to capture their beauty and emotion. Chaumet presents the new bolero watch. Boléro is the new watch for women from Chaumet. In elegant and sensual gold, it is the marker of women who choose distinction. With a circular bezel, sweeping profile, and pared-down dial, the sense of purity is extended by the bracelet in gold mesh, Boléro is available in yellow and pink gold, as a large model with a Swiss automatic movement or a small model with a Swiss quartz movement. Its dial exists in sober white or a more visually arresting graphic black. Rado Tradition Golden Horse Limited Edition. Rado created the Golden Horse in stainless steel a bold move in an age where precious metals such as gold and platinum were traditionally used in watchmaking. The 37 mm stainless steel case houses the curved, crimson and black dial. With its ombré effect, it is the perfect background for the two gold coloured seahorses. Golden Horse is written across the dial in the same font as that used in 1957. The date window at 3 o’clock has red numerals on a white background. The printed calf leather strap uses the crocodile pattern from the flank. The Autavia collection opens a new chapter for TAG Heuer. TAG Heuer reintroduces the Autavia as a stand-alone collection with a range of models that boast the versatility, ruggedness and reliability that characterised the original Autavia watches produced in the 1960s. The stainless-steel Autavia 42 mm three-hand models feature the rounded first-generation Autavia case and bevelled lugs from the 1960s. A bidirectional rotating bezel with a 60-minute scale in black ceramic, blue ceramic or stainless steel enhances the sporty look of the watch. The smoked dial is available in black, grey or blue, and has a date window at 6 o’clock. The leather calfskin straps come in dark brown or light brown. Van Cleef & Arpels unveils Treasure of Rubies. Van Cleef & Arpels’ imagination ever since 1906, inspiring some of its most emblematic creations. Today, the Maison pays tribute to them with the High Jewelry collection Treasure of rubies. The double Peony clip was made up of two separable clips each depicting a peony one budding, one with spreading petals on diamond foliage. The Duchesse necklace is inspired by the Cravate necklace, created by Van Cleef & Arpels in 1936 for the Duchess of Windsor. It is remarkable for its 73 perfectly matched oval rubies (90.64 carats), along with the fluid movement of its interlaced ribbon motif. Backes & Strauss presents Miss Victoria Collection. Backes & Strauss’ Miss Victoria collection brings a renewed fresh and youthful elegance to the Victoria timepiece family, the collection has blossomed into a wider colour palette. From the pastel pink and lilac hues of the new mother-of-pearl dials to the indigo and dark blue tints of the satin or leather straps. The natural beauty of the mother- of-pearl dial, complimented by scintillating diamonds (and coloured gem stones) set into an 18k white or rose gold case, paves the way for the Miss Victoria to bloom into the must-have watch for women. Watch & Jewellery show opens in Sharjah. 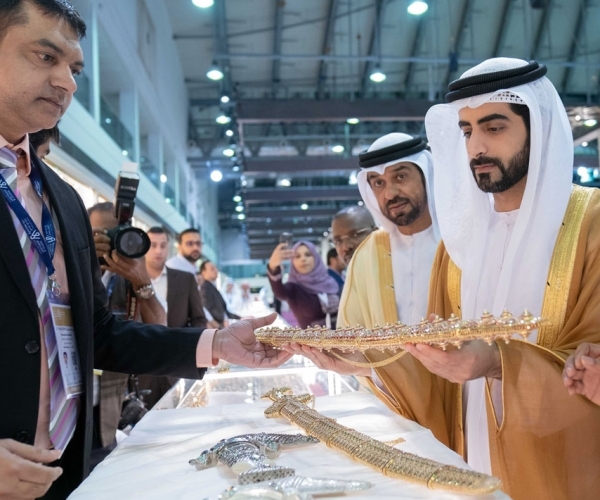 The 46th Watch & Jewellery Middle East Show was inaugurated by Sheikh Salem Bin Abdul Rahman Al Qasimi, Chairman of the office of His Highness the Ruler of Sharjah, in the presence of senior government officials, SCCI board members, diplomats, jewellery executives and industry representatives. Held under the patronage of H.H. Dr. Sheikh Sultan bin Muhammad Al Qasimi, Supreme Council Member and Ruler of Sharjah, the event was continue until Saturday. Stars shine in BVLGARI at the 64th Annual David Di Donatello Awards. BVLGARI Brand Ambassador Matteo Bocelli wore an Octo Finissimo Tourbillon with a black alligator strap and cufflinks during his performance on stage. Singer Andrea Bocelli chose for his performance with his son a pair of cufflinks in pink gold. Veronica Berti - philanthropist and wife of Andrea Bocelli- wore High Jewelry Serpenti earrings, paired with High Jewelry ring in platinum featuring emeralds and diamonds and completed her look with High Jewelry Serpenti ring in white gold set with tanzanite, emeralds and diamonds. Zheng Yunlong wears Girard-Perregaux’s Laureato Chronograph to Dumbo Premiere. 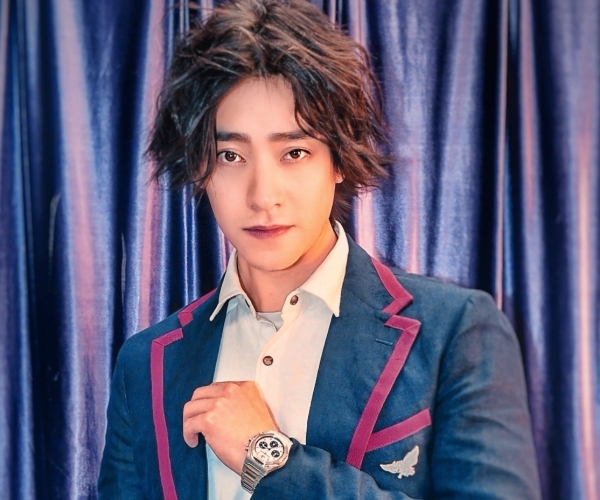 Last week in Shanghai, for the premiere of most expected blockbuster Disney’s fantasy adventure film Dumbo, Chinese renowned musical performer Zheng Yunlong attended, pairing Girard-Perregaux’s Laureato Chronograph with his elegant suited style. Be constantly updated on the latest Watch & Jewellery Business markets of the Middle East, as well as information on competitors, promotions, product trends, industry analyses, appointments, new product introductions & developments and market research. Our weekly 'Arabian Watches & Jewellery Business Newsletter Broadcast' is distributed to over 18,000 industry executives, Watch & Jewellery manufacturers and distributors, retailers, investors and media consultants globally.